With definite touches of Hammond’s life in New Zealand, as told by Hammond ‘Ninety Mile Days’ is "a little story that looks back at a time spent at Ahipara up north in the mid seventies, Susan and I went back recently to get some photos for the cover." A few of the songs I wrote a long time ago and never recorded. I used to do "For the First Time" over 30 years ago although I’ve changed the words and the great Midge Marsden used a version of ‘Strangers Girl’ for his Burning Rain epic in 1990" he adds. 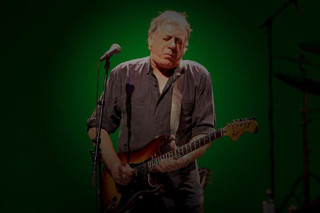 The album was once again produced by Rikki Morris, who also plays guitar. "Rikki had this idea of recording the rhythm tracks in the old theatre in Devonport and it sounded like an interesting idea so he dragged all his gear down there, set up and we were away!" says Hammond. 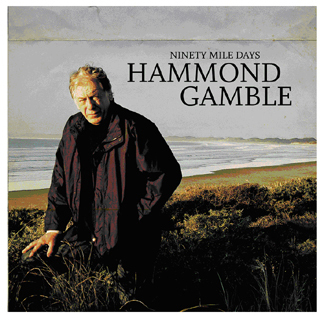 Both personal and reflective, Hammond finetunes his craftmanship on ‘Ninety Mile Days’, available in stores Now. 1. I Had A Dream - I guess you could say ‘Ninety Mile Days’ is a collection of love songs - I wrote this one for my wife Susan. 2. Ninety Mile Days - This song was written looking back at a time I spent up at Ninety Mile Beach in the 70’s with my girlfriend. Her place was right on the beach and we seemed to live on tua tuas and bread. It’s a bit of a ‘rose coloured glasses’ look back. 3. It’s Been Too Long - A kind of shuffle blues I wrote quite a while ago. The lyrics are a little mean sounding? “Its over” probably would’ve sufficed but where’s the poetry in that? 5. Memory No.1 - This was meant to sound a bit “Delaney and Bonnie” when I was writing it but it’s turned out a bit softer. It’s about a couple who travel all over trying to find a better place then eventually drift apart. 6. Back Where I Belong - I was overseas one time and couldn’t get a flight home for a couple of weeks and it was a drag. I added the weather stuff for a bit of drama. 7. Is This The Last Time - When I wrote this I was thinking of a bit of an early John Lennon type song although it doesn’t sound like it unless you imagine you’re John Lennon and thinking “this doesn’t sound like one of mine but it is”! 8. Waiting For Rain - I got this idea a couple of years back watching TV about the drought affected Australian farmers but seeing as I don’t know a thing about farming it turned into a boy/girl song. 9. For The First Time - I’ve always liked this style of soul/blues. I wrote a good part of it ages ago and added the wild orchids etc. recently. Susan always has some growing - I remember once she tried to bring some back from Thailand but MAF binned them and told her off. 10. Madeleine - I was asked to write a couple of songs about sailing in the 80’s. This one was passed over for a more jaunty number I’d written. I always liked it so I have kept the melody and written a new set of lyrics. 11. Stranger’s Girl - I’ve written a few songs about divorce or breakups, and it’s not something I have much experience of. This is a bitter/sweet take on how I imagine it often goes! 12. I’ll Look Over My Shoulder - I wanted the album to return to the “90 Mile” theme so after we’d finished the rest of the album I wrote this folk/blues. I sang and played it live with Steve.